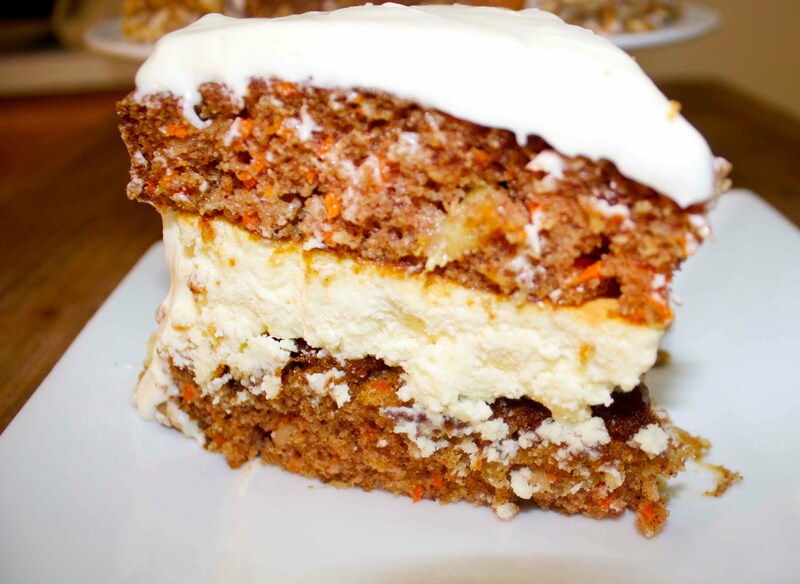 With this recipe you propose then you can prepare at home a delicious orange carrot cake with cheese, a cake with a flavor and texture very striking. We show you how to do it step by step, read on. Carrots grate like in Korean, can be a little thinner for carrots. Beat with a mixer with sugar and vegetable oil until the carrot juice. Add the eggs, whipped with a pinch of salt. Stir until smooth. Raisins soak for 30 minutes. in drinking water. Water drain, raisins unfold on screen and pat dry on paper towel. Cut into small pieces about the same nuts, candied fruits and raisins. Add the carrot mass mix. In a separate bowl, mix the sifted flour, cinnamon and baking soda. Mix until smooth two resulting parts. Dough pour into a round shape of the split, the laid paper baking. Bake at 170 ° C for 20-30 minutes., To full readiness. Cupcake, remove from oven and cool completely. Cut the cake into 2 2 cm thick, cut off the top part of the cake, if necessary, to form a smooth layer. Cream cheese mix with sugar at a slow speed until it is completely dissolved, slowly add eggs and at the end – cream. At the bottom of the form, place the cake on top – filling evenly. Bake at 140 ° C 30-45 min. Remove the cheesecake from the oven and let cool completely on a wire rack. Get him in the fridge for 3-8 hours. The remaining cake grease with jam and place on the cooled cheesecake. Obtyanite mastic cake and serve.